While most vehicle shoppers on a budget feel that a used model is their only option, that’s not always the case depending on which brand, body style, and amenities they’re after. 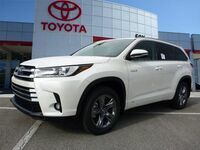 At Fox Toyota in Clinton, TN near Knoxville, our showroom has a handful of Toyota models that can be purchased new for under $20,000 making owning a new vehicle a possibility for many buyers at many budgets. Use the link below to head straight to the new cars available at Fox Toyota for a starting price of $20,000 or less or keep reading to learn more about our budget-friendly inventory. If you don’t see what you are looking for, give us a call and let us know and we may be able to help you source your preferred model. While the prices of our new vehicles fluctuate for a variety of reasons, in general, car shoppers interested in a new model that costs $20,000 or under will be looking at budget-friendly Toyota sedans like the Toyota Yaris and Toyota Corolla. Both offer a lot of bang for the buck with amenities designed to add comfort and connectivity to each trip for an enjoyable experience. In addition to lower starting MSRPs, the Toyota Yaris and Toyota Corolla lineups are also both fuel efficient so drivers can continue saving long after the sale. To browse the current budget-friendly new Toyota inventory available at Fox Toyota, visit the online inventory page linked on the main menu and use the toggles on the left-hand side of the page to narrow the selection by price. After selecting a price of $0 to $20,000, a selection of matching vehicles will display. Click each vehicle to learn more about its available amenities and features or go ahead and set up a test drive of your preferred model so you can get behind the wheel. The Fox Toyota team looks forward to helping you find and purchase your next vehicle!